Amazon has rocked the eReader and tablet world today by announcing Kindle Fire and releasing some new Kindle eReader models at extremely low prices. You can check out Amazon’s charts that compare the different devices for yourself (look at ‘Compare Kindles’ on a page like this), but I want to go over what I consider the main differences between them. The basic Kindle is starting at $79 (with special offers) or $109 without special offers. $79 is a pretty darn low price for an electronic device, but more importantly, it’s way lower than most other eReaders. The new Sony Reader WiFi, for example, is available for pre-order right now for $149. Even if you don’t want the ‘special offers’ screensaver ads, you only have to go up to $109. It’s also important to note that this device does not have a touch screen. Navigation is done with the button at the bottom-center. This is similar to the basic Kindle, but with a touch screen. It is either $99 with special offers, or $139 without special offers. You could compare this one to the Nook Touch. It also has audio capabilities. The next step up is the Kindle Touch 3G at $149 with special offers or $189 without. These models will let you connect to 3G networks, like you do with your cell phone, to get internet access even when you can’t get on WiFi. All of the Kindle models work with Amazon’s cloud system, which means that you don’t have to download ebooks to your computer, and you can easily use your digital content on multiple devices that you own. This is the biggest news. There has been speculation about a Kindle tablet for a long time. Amazon has announced a tablet-like Kindle device, and it’s available for pre-order for only $199. One of the things that has been wondered for so long was whether Amazon would be able to release a device that would be a competitor for the Apple iPad. This cnet article says they have, but I don’t know if I agree. Since this is a smaller device at 7″ and lacks many of the features of the iPad, in my opinion it’s more comparable to the Nook Color. Both of those devices are more like big brothers to eReaders. They have the color touch screens and run on Android, which means you can watch videos and play games, so in the end they are eReaders with some additional fancy features. On the other hand, that cnet article points out something very important: if you’re an average user who’s using these devices for typical stuff like reading, video streaming, and basic internet access, you don’t need an expensive iPad. And on top of that, if you’re going to be traveling with the device it feels a lot better to tote around a $199 tablet rather than one that cost you $500+. I think it will come down to what you actually need to use the device for. If you will actually use additional features that the iPad has (like Bluetooth, video conferencing, or HD video recording) you might be willing to spend the money for those. 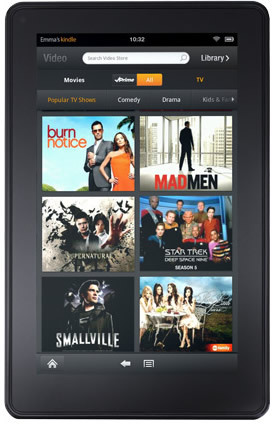 But if you’re the average user, something like the Kindle Fire might be perfect. I’m going to be really interested to find out how open the Android OS will be on this device. If you can install Aldiko Book Reader on it, that will mean that you won’t be tied down to the Kindle store anymore, and you’ll be able to get ebooks from other websites. I suspect that it won’t be possible to install other ebook apps in the beginning, but people will find a hack-around for it. The other big question is how this is going to affect the market for eReaders as a whole. These new Kindles are being sold at such a low price that other companies might not be able to compete at all. Or, it might force companies to find ways to use cheaper materials to build these devices. It will be interesting to see how everyone reacts to this. PC Mag’s 2011 Readers’ Choice Awards for Tablets and eBook Readers was posted last month, but I just now ran across it. Some of their results are what I would have expected, but some of the data was pretty surprising to me. It’s no surprise that the Apple iPad was chosen as the favorite. What did shock me was that the Asus Eee Pad Transformer was also chosen as a top pick. I’ve never even seen one of these sold in a store. I knew that these devices existed but I didn’t think that anybody actually used them, because as someone who provides tech support for this category of devices, nobody has ever asked me a question about them. It seems like it could be a cool device to own because of its flexibility … maybe it’s just being overshadowed by the larger companies? Apparently they let people fill in their own answers, and almost everyone wrote in Amazon Kindle or B&N Nook. The only other devices that people mentioned often enough for PCMag to get enough data for were the Sony Reader and Pandigital Novel. I’m not doubting their data, but I find this hard to believe. There are about a zillion different eReader devices available and some are quite popular, like the Kobo eReader or BeBook. It seems quite odd to me that at least the Kobo didn’t get enough mentions to be included. It’s not surprising that the Kindle and Nook were the most popular, for the same reason mentioned in the article: they are tied to previously established bookstores. Most people will buy eReaders from those companies because they are already shopping at those stores. Check out the article‘s second and third pages for charts. What is your choice for best tablet or eReader? Anything besides the iPad, Kindle, or Nook?